To Enlarge Click On The Site Plan! Looking to reconnect with nature, get away from the hustle and bustle of city life, or bust out the paint brushes? Here, at ICFhome.ca, we know that few decisions are as important as choosing a place to live. So let us share with you, our vision of “Cedar Ridge Estates”, the place that is is quickly becoming Georgian Bay’s most prestigious address. Nestled in the heart of Cedar Ridge, amid a canopy of pines, oaks and maples, blended with a spectacular scenery of emerald green farmer fields—is a place where dreams of the good life become reality. ICFhome.ca invites you to be part of the “Cedar Ridge Estates”, exclusive community, a collection of beautifully forested 1.5 – 2 acre lots to build your four-season retreat. 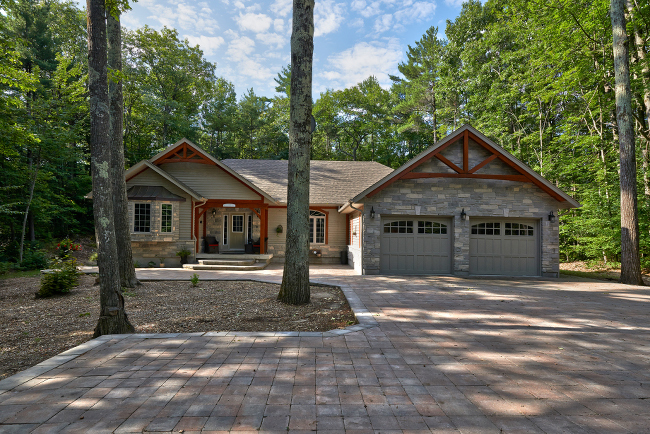 Approximately 45 minutes drive straight North from Barrie, at the edge of Tiny Township, lies this spectacular stretch of country, of crystal clear waters ideal for boating, sailing and swimming, a distinct alternative vacation destination to Lake Simcoe, Muskoka, Horseshoe Valley and Collingwood. Now, you can break free from the polluted and hectic city life and indulge in the luxury of your own country estate. Each lot is laid out in perfect harmony with nature promising beauty and privacy. A game of soccer with your family, tree climbing with the children, endless hours amongst mother nature. At the heart of Cedar Ridge is a natural, unspoiled environment that will fulfill the expectations of anyone for their ultimate dream residence. Here, you will find a sheltered, peaceful landscape overlooking a secluded channel on the southern tip of Georgian Bay, rich in amenities and spectacular panoramas. For a privileged few, Cedar Ridge will be the opportunity of a lifetime. This unique development of 500 acres on 7,500 feet waterfront of beautiful crystal clear waterfront on the Georgian Bay shoreline. 90 Minutes from Toronto (weekend traffic is far less than other destinations such as Muskoka). It’s a much easier drive on a busy weekend compared to most recreational destinations – the last half of the drive (from Barrie to Cedar Point) is largely through picturesque, quiet rolling farm country. Click here for more info on Georgian Bay. The area has a rich history. By 1639, French Jesuits founded Sainte-Marie among the Hurons, Ontario’s first European community, on the Wye River. In the early 1840’s, families from Quebec, attracted by promises of cheap and fertile land, came to the area of Tiny Township and settled on the present site of Lafontaine, just minutes from Cedar Ridge. Arts, culture, sports and active lifestyle. The area has thriving art and culture with places such as the King’s Wharf Theatre, the Midland Cultural Centre and local art galleries. You will find plenty to do in the summer with the local farmer’s markets, many festivals such as the annual Festival du Loup, Pow Wow, Canada Day celebrations only to name a few. In the winter, you will keep busy with the many winter festivals in the area and all the outdoor activities nature has to offer. A very special place for family and friends to enjoy. Perfect for nature lovers with a diverse selection of plants, animals, birds and aquatic life – the water of the bay is crystal clear. Located at the convergence of the southern and northern ranges of numerous bird species making it ideal for birdwatchers. Adjacent to Cedar Ridge you can connect with the main snowmobile trail and will find many cross country ski trails. The nearby Tiny Township Trail system is 22 kilometers long with 13 bridges that crisscross meandering rivers, streams and intersecting concession roads. Fully built with Insulated Concrete Forms (Nudura). No mainetance exteriors, stone & manufactured wood siding. Vaulted and coffered 9′-12′ ceilings throughout. Flooring: natural stone and engineered hardwood. On approx. 2 acre very private wooded lot. At ICFhome.ca, we build more than homes. We build communities. For more than 30 years, we’ve been building communities in picturesque settings where luxury meets convenience, and where neighbours become lifelong friends. Each ICFhome.ca’s home offers a combination of quality materials and superior design, where every detail is meticulously crafted, and every enhancement you select is seamlessly added to create a customized home that is uniquely yours.